And they came to Bethsaida. 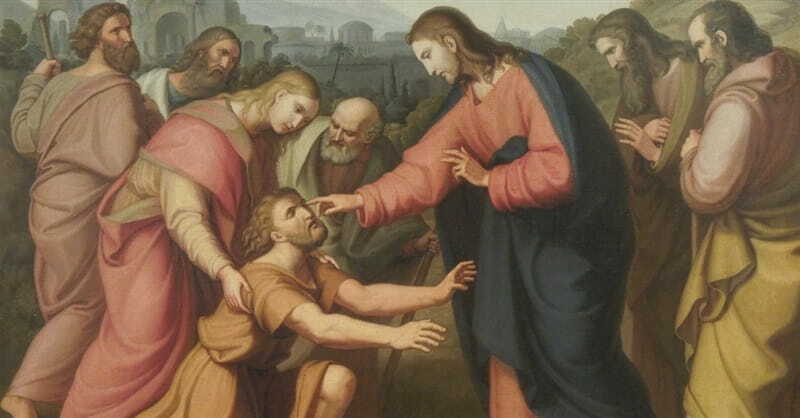 And some people brought to him a blind man and begged him to touch him. And he took the blind man by the hand and led him out of the village, and when he had spit on his eyes and laid his hands on him, he asked him, “Do you see anything?” And he looked up and said, “I see people, but they look like trees, walking.” Then Jesus laid his hands on his eyes again; and he opened his eyes, his sight was restored, and he saw everything clearly. The healing is curious in that the man's sight is initially only partly restored. Jesus has to do the healing twice. One hint, I think, comes in the story that immediately follows. Jesus asks his disciples who he is and Peter confesses, "You are the Christ." So Peter sees Jesus. But only partly, fuzzily. Because right after Peter's confession Jesus goes on to speak about his coming passion and death: "And he began to teach them that the Son of Man must suffer many things and be rejected by the elders and the chief priests and the scribes and be killed." Scandalized, Peter pulls Jesus aside and tries to correct him. Jesus then wheels on Peter and says, “Get behind me, Satan!" Peter is having his vision restored like the blind man, in stages. Peter sees Jesus as the Christ, but his vision of what that means is still fuzzy and blurry. When Peter confesses his vision is only partial. Peter's sight requires additional adjustment. Peter will eventually come to see Jesus clearly, but only in stages.